A blend of cream cheese, yogurt and honey makes a luscious topping for this fruity dessert for two. Top with pecan pieces and enjoy! 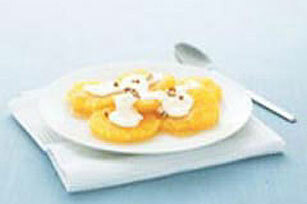 Arrange oranges on 2 small dessert plates; drizzle evenly with 2 tsp. honey. Mix reduced-fat cream cheese, yogurt and remaining honey; spoon over oranges. Substitute 1-1/4 cups assorted berries or your favorite seasonal fresh fruit for the oranges. Sauce can be stored in tightly covered container in refrigerator for up to 1 week.